Peak 10042 is on the ID/MT border. I climbed Ajax Peak last and then climbed Peak 10042, unofficially called Don Moore Peak by Darcy. I ascended Darcy’s Northwest Ridge Route, but descended a new route (the Northeast Ridge Route). Please refer to the Montana side approach via Ajax Lake Trail under the Ajax Peak posting. Date of Climb: 8/3/17. The jeep road/trail ends at the outlet to Ajax Lake (8,522’). From the end of the road, follow a weak climber’s trail alongside the northwest edge of Ajax Lake to reach the lake’s southwest end. This is a rather tedious bushwhack through downed timber, brush, and talus. You will be happy to reach the wide-open talus field at the uphill end of the lake. The objective is now to climb to the saddle on the Continental Divide WSW from Ajax Lake. But the face/headwall is a rather imposing mess, with a mix of rock and brush and, to complicate matters, the two gullies leading directly to the saddle are filled with snow, even into late summer. Scramble up the left/south side of an inlet stream through a mix of talus and knee-high brush. You will soon reach a small upper basin that sits below the snow-filled gullies. 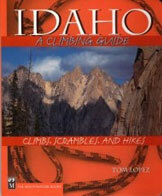 Here you will find a good climber’s trail in the talus/scree. This trail climbs diagonally southward, with a few switchbacks thrown in for good measure. It tops out on the ridge/Continental Divide on the southeast side of Point 9522, about 25 feet below the top of this point. Point 9522 has an ID/MT Boundary Post on it. 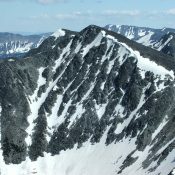 If you plan to climb Ajax Peak’s south ridge (as I did), it is a 75-foot drop from the top of Point 9522 to the ridge saddle at the base of Ajax Peak. But, fortunately, you are climbing Peak 10042 today and you are actually in a great position to complete the Northwest Ridge Route. Unfortunately, from the entry point onto the ridge, you must drop about 200 feet to a saddle that sits at the base of Peak 10042. In this section of the ridge scramble, you must contend with a combination of ridge talus and some pesky, low-growth ridge firs. From the saddle, it’s about 750 feet of uphill to the top of Peak 10042. This is a straightforward Class 2 scramble up a tolerable mix of talus and scree. The summit of Peak 10042 has a large cairn and a stunning aerial view down to Ajax Lake. The north face of this peak might render a nosebleed to those climbers afflicted with acrophobia. The late Michael Darcy was possibly the first to climb the Northwest Ridge Route and he unofficially named the peak “Don Moore Peak” in memory of his grandfather. Like Ajax Peak, Peak 10042 sits directly on the Continental Divide. In my never-ending quest for variety in my climbs, and to avoid the unpleasant brush/talus mix above Ajax Lake’s southwest side, I decided not to descend back down to Ajax Lake via the Northwest Ridge Route. 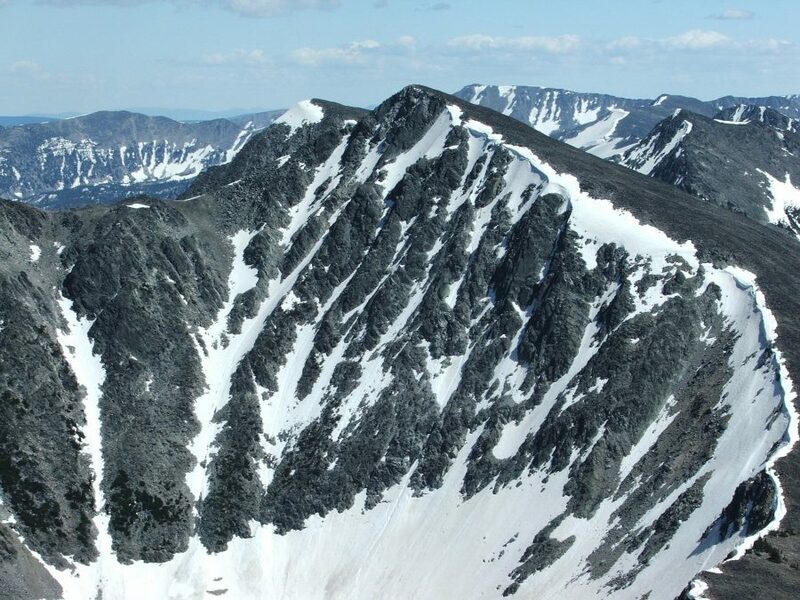 I would rather attempt a descent of the narrow, exposed Northeast Ridge of Peak 10042 to access the Continental Divide Trail (CDT), which crosses the base of the Northeast Ridge. After ascending the Northwest Ridge Route (Class 2) on Peak 10042, I decided to spice things up a bit and descend the narrow, exposed, choppy Northeast Ridge. The initial descent from the summit is a combination of rocky ridge outcrops and steep talus. The ridge soon forks. Take the right/northeasterly fork which leads down to the north side of a beautiful tarn at 9,180 feet. The northeasterly leg of the ridge is the crux of this descent and is a full-on Class 3 endeavor. You will be happy to reach the gentle tundra on the northeast side of the pristine tarn. Proceed northeast across the open, gentle terrain and find the [blessed] CDT awaiting you. Please note that the USGS map is incorrect in its placement of the CDT. The CDT actually descends from a ridge saddle just southwest of Point 9250 and does NOT approach the tarn at 9,180 feet. The CDT is well-beaten and easy to follow from below the saddle all the way down to the Ajax Lake Road/Trail. The CDT descends through a lovely pine forest and skirts the left side of a picturesque unnamed lake at 8,500 feet, a lake that is surrounded by forest and is far more beautiful than Ajax Lake. It is a pleasant surprise on the descent. The trail then descends steep switchbacks and requires two creek crossings on boulders. After the second creek crossing (Big Swamp Creek), the trail reaches and crosses Ajax Lake Road/Trail. The trail crosses the road at least a mile below the lake. From here, return to your vehicle parking spot. The CDT is well-signed at this road crossing.